Fete intervenes 54 years ago today. Lennon meets McCartney. There are dates in pop history that we most likely all remember, Elvis’ death, Live Aid, Woodstock, but what about July 6, 1957? The late fifties – Cliff Richard was yet to emerge, Elvis was King, Bill Haley was still having hit records and Teddy Boys greased back their hair in the embryonic coffee bars. In Church Road, Woolton, a suburb of Liverpool, it’s the day of the St. Peters Church Garden Fete. Starting time 3.00pm, all proceeds in aid of church funds. The Fete is preceded by a parade down Church Road – scout and guides, Morris Dancers, the Rose Queen Sally Wright and on the last lorry, a bunch of six young skifflers, The Quarrymen – guitarist Eric Griffiths, banjo player Rod Davis, tea chest bassist Len Garry, washboard man Pete Shotton, Colin Hanton on drums, and singer-guitarist John Lennon. Arriving at St Peter’s Church field, the lads from their lorry play covers of Lonnie Donegan, and Gene Vincent and traditional skiffle numbers like ‘Maggie Mae’. Looking on is another young music hopeful, his guitar perennially round his neck, probably for no better reason that that is where it lives. 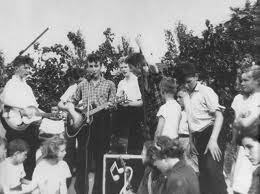 He watches The Quarrymen. That evening, the boys repeat and extend their performance in the Church Hall. The spectator is there too, and eventually John Winston Lennon and James Paul McCartney have their first conversation. It is a date we should all remember as the moment that changed pop music forever. This entry was posted in 1957, HISTORY OF RECORDED MUSIC and tagged 1957, cliff richard, colin hanton, elvis presley, eric griffiths, gene vincent, john lennon, len garry, live aid, liverpool, lonnie donnegan, maggie mae, morris dancers, paul mccartney, pete shotton, rod davis, rose queen sally wright, st. peters church, teddy boys, woodstock, woolton by Nipper. Bookmark the permalink.